Corning introduced ultra-slim flexible glass and the Eagle XG Slim line, full details at X-bit Labs. “As handset, tablet, and notebook device manufacturers go thinner, Corning’s latest innovations in Eagle XG Slim and ultra-slim flexible glass are extraordinarily well-positioned to meet these challenges and enable broader touch technology penetration,” said Dr. Peter Bocko, chief technology officer for Corning Glass Technologies. Corning booth at Society for Information Display (SID) trade-show will feature product samples using both Eagle XG Slim and ultra-slim flexible glass as well as Corning Gorilla Glass 2, the next generation of the popular, damage-resistant cover glass for consumer electronic devices. A multi-touch 82" display showcasing Corning Gorilla Glass for large applications will also be on hand. 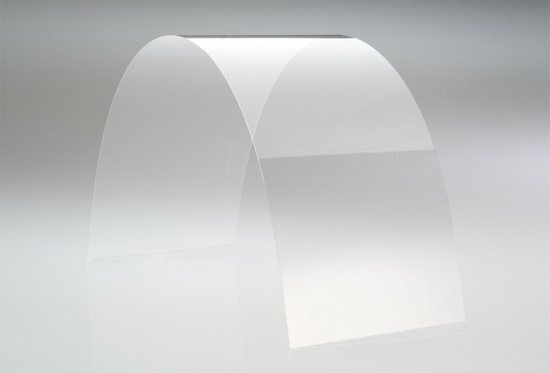 Corning’s flexible glass substrates will enable high-resolution flexible displays for consumer devices, including e-book readers. These displays consume much less power than other technologies, and have the potential to replace paper in many applications.